Composed by Maurice Ravel (1875-1937). Edited by Douglas Woodfull-Harris. This edition: urtext edition. Stapled. Barenreiter Urtext. Performance score (2). Duration 22 minutes. Baerenreiter Verlag #BA09417. 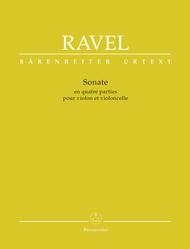 Published by Baerenreiter Verlag (BA.BA09417). ISBN 9790006538454. 32.5 x 25.5 cm inches. Text Language: German/English/French. Preface: Juliette Appold / Douglas Woodfull-Harris. In 1920 Maurice Ravel was asked by his publisher Durand to contribute to an issue ofLa Revue Musicalededicated to Claude Debussy. 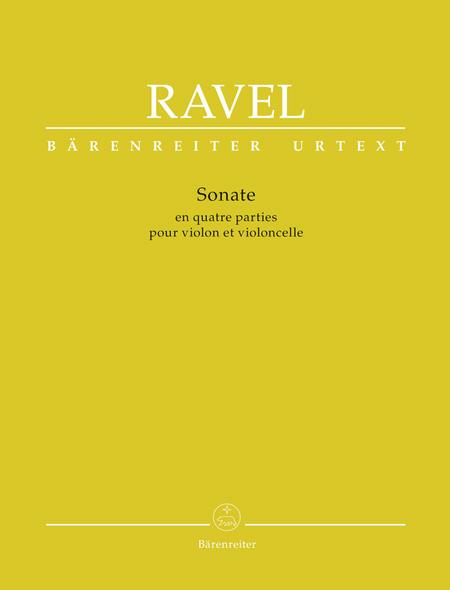 A supplement included the first movement of Ravel's Sonata as well as works contributed by Debussy's friends Stravinsky, Satie, Dukas, Bartok and de Falla to name only a few. This 1st movement of Ravel's Sonata, of which the autograph is lost, then developed into a large scale four movement chamber music work utilizing a more modern music vocabulary than found in almost any other Ravel composition. Barenreiter's scholarly-critical edition, the first ever of this masterpiece, presents the work in two performing scores. It contains an introduction on the history of the work reflecting Ravel's work and rehearsals with violinist Helene Jourdan-Morhange and cellist Maurice Marechal. Sources for this new edition include the engraved copy, the personal autograph scores (with earlier versions of some passages) which were used to rehearse the work and the first edition scores with emendations by Jourdan-Morhange and Marechal. Included in the appendix are the original fingerings by the performers which are not found in the first edition. They reflect how Ravel must have heard the work in rehearsals and as such are a document of early 20th century performance practice.